What is Head End Power? We have a brief description of head end power elsewhere on our web site. HEP is a system of providing power on railroad passenger cars. are distributed by Northwest Rail Electric for use in the Head End Power market. They are used to provide electrical connections on cars, locomoitves, or for station to car or locomotive applications. These rugged, single molding head end power connectors from Clements National are approved for use on cars that are designed to be compatible with the Amtrak Head End Power system. Leading edge bevel of receptacle skirt maintains continuous low mating forces. Mating/Unmating Force: 70 lbs. Max. XXXX - Denotes tip to tip length in inches. Standard stock length is 85 inches. Plugs may be ordered with the AMP # 326803 lugs crimped on the end of the wire, as required by Amtrak HEP standards. XXXX - Denotes wire tip to mounting flange length in inches (Not Applicable to MRA-H Units, Wire Tip to Mounting Flange applicable only to single ended receptacles). Standard stock length is 24 inches. Other lengths are available but are almost always long lead time. Receptacles may be ordered with the AMP # 326803 lugs crimped on the end of the wire, as required by Amtrak HEP standards. Northwest Rail Electric also has available HEP Mounting Pates that will position the HEP receptacles on the end of the car in the required Amtrak and APTA locations. The part number for this housing is MRA-H, and the receptacle (shown above) is fitted inside. These receptacle housings are made of durable Aluminum, and are equipped with spring loaded lids that hold the plugs in place. The lid also keeps the contacts from been damaged, and helps ensure long connector life. The standard color is red (shown at right), but other colors have been produced and are possible given sufficient quantity. 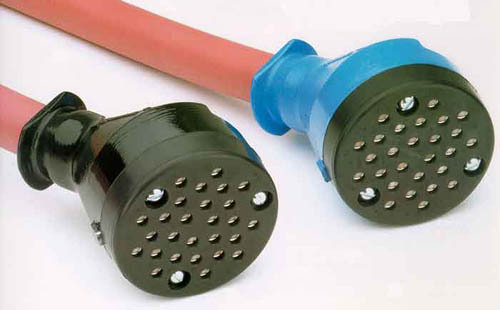 Standard length for extension cables for Wayside Power (Yard Power Systems) is 25 feet. While not specifically part of the head-end power system, addition of communications and multiple-unit cables to passenger cars is usually done at the same time, if it is desired. Comm connectors are required for Amtrak compatibility, but MU is only required on certain routes. To that end, Northwest Rail Electric has a number of standard Comm and MU parts used in converting passenger cars to Amtrak compatible operation. We do not usually stock the locomotive cable lengths for receptacles and jumpers, but we do sometimes have that material as well. As our market is almost entirely railroad passenger cars we are rarely asked about these parts for locomotive use and therefore do not stock the required parts. Standard Comm and MU receptacles. Standard Comm and MU jumpers. These are the parts usually required for converting a passenger car to HEP and allowing it to operate as a private car in Amtrak service. 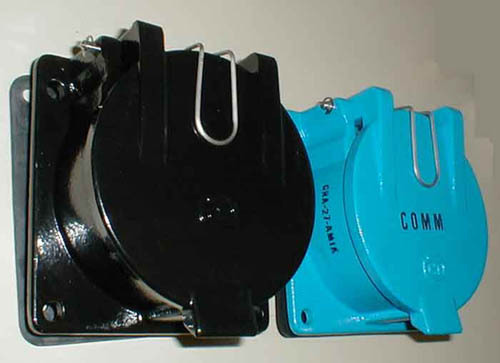 Northwest Rail Electric also has available mounting boxes for COMM and MU. See the bottom section of our HEP Mounting Pates page. HEP Mounting Pates and COMM and MU connector mounting boxes. Various Specialized Hardware required for a HEP conversion. A List of Parts Required to convert a typical railroad passenger car to Amtrak compatible HEP.